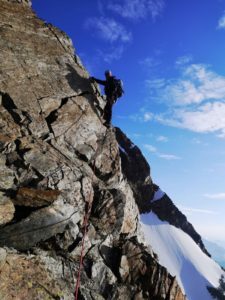 Nutrition and hydration for outdoor events and alpinism. This nutrition talk was first given after a few minutes preparation to the AC aspirants meet held at the George Starkey hut in Patterdale in the first week of June 2017. Attended by 12 people with Sandy Allan acting voluntarily as instructor. At the end of the evening Sandy gave us his talk about his amazing Mazeno Ridge/Nanga Parbat traverse which resulted in the last 2 days without food or even water! My background and where I gained my nutrition know how. I have been involved with a wide number of activities starting with bike racing, followed by Nordic ski racing, 2 day mountain marathons, fell running, alpinism, cold trips to Greenland, Antarctica, K2 base camp in winter, and Denali. In my professional life, as an equipment designer (Karrimor and OMM), I have come into contact with many knowledgeable outdoor professionals and have always taken the opportunity to ask questions. As Karrimor, I took on the distribution of Hi-5 nutrition products to the outdoor trade. We needed to become well-informed and clued-up on the subject in order to communicate to customers. During the early 1990s we held a performance conference at Karrimor in Clayton-le-Moors, inviting our sponsored athletes from cycling, climbing and adventure racing. 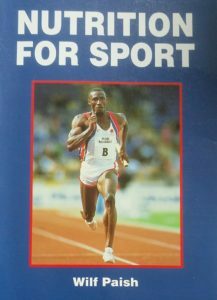 One of the invited speakers was Wilf Paish, a leading national athletics coach at the time, and author of the book, Nutrition for Sport, published in 1990. He told us some very amusing stories about being called in to a rugby club to help improve performance. See postscript below. Overall the cyclists were surprised how far behind the climbers were, in their understanding of nutrition. I have also been keen to improve my own performance because I could see how little I knew about hydration and nutrition, when I was bike racing in my early days. As I grew older I realised that I could use my knowledge in this area to help compensate for my increasing age, because others didn’t seem to want to bother changing the way they did things. Until, that is, younger climbing partners noticed that I seemed to be ‘punching below my age’ so to speak. But they didn’t want to bother looking at the broader picture and the combination of things that I use and just went for the easy route so to speak and they started using gels only. upcoming exhibit. We were asked to research why the 1953 Everest expedition succeeded. What we saw as important was that the logistics to put the right amount of food and particularly the volume of fuel required to melt drinking water was a critical factor. In the mountains and polar areas water has to be produced by melting snow. In the Edward Whymper era in the nineteenth century this was achieved by either an alcohol or a ‘rock oil’ (Paraffin) powered stove. But the flame burnt with very little oxygen and the cooks on polar exploration trips always had soot-blackened faces! When Nansen made the first crossing of Greenland in 1888, he made the first expedition use of the Primus stove, (the mechanism of which was first invented as a mobile blowtorch for mending roofs. The Primus effectively extended the effective range of poor exploration by 50% because the air mix mechanism was extracting much more heat from the fuel. Vitamins were not scientifically identified until 1912. The medical records state that Captain Scott died of scurvy during his bid to reach the South Pole. This is despite 200 years of practice by Captain Cook and others to ensure that fruit was included in the diet, particularly limes (hence Australians call English people ‘limeys’). Nansen and Amundsen used the best practices known by the North American Indians and Inuits, who made Pemmican, a mixture of meat, fat and Cranberry. Thus a good balance of protein, fat and vitamins. The British made three attempts on Everest in the 1920s. One man in particular was particularly innovative on the second Everest expedition in 1922. George Ingle Finch was a man who inspired many of the early mountaineers with his book, “The Making of a Mountaineer’. 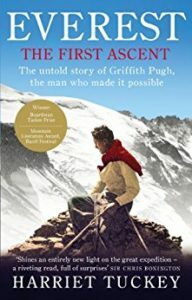 He was a government scientist and realised from his pressure chamber tests that it was highly unlikely at this stage that mountaineers would be able to climb Everest without supplementary oxygen. But the relevance to my talk here is the fact that the Primus stove itself needed oxygen to burn correctly. He modified the stove in several ways: increasing the pump size and decreasing the jet size so that it would work above 25,000 feet (7,620m). This basic work was continued and improved further by Griffith Pugh for the 1953 expedition. Incidentally, George Finch was the man who invented the first down jacket, but they simply laughed at him. The TCA or Krebs cycle was not discovered until 1937 and this was the mechanism by which, to oversimplify things, our food is turned into energy and muscle glycogen. Actually it’s worthwhile noting that 75% of everything we eat is turned into heat and only 25% goes into energy i.e. into muscle glycogen. Yes; food does indeed keep us warm! 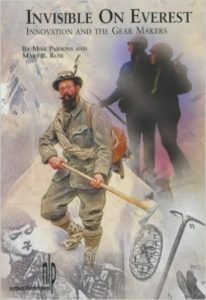 1952 and 1953 were important years in mountaineering. In 1952 the Swiss attempted Everest twice, pre-and post monsoon. Having remained neutral in World War II they did not lose any mountaineers or guides in the war, unlike Britain and many other countries. They had therefore a much stronger team than the UK had, so why did they fail and why did the British expedition succeed in 1953 with technically a much weaker team? 1979 is noteworthy as the introduction of the Camelbak bladder. So those are some key noteworthy dates I recall, so let’s have a look now about food itself, and what to eat and drink on the hill. Here is a sports nutrition website which makes an interesting analogy; quote “Electrolytes are analogous to the motor oil in your car—they don’t make the engine run, but they’re absolutely necessary to keep everything running smoothly”. Proper functioning of the digestive, nervous, cardiac, and muscular systems depends on adequate electrolyte levels. We lose electrolytes during sweating and rather a lot in the case of sudden evacuation of the bowels, which is not unknown in the mountains! Electrolytes are used for medical purposes after say serious diarrhoea to replace body salts lost and is available at the chemists in small expensive packets known as Diarolyte. Electrolytes were the first commercially available athletic drinks in the late 1970s early 1980s. I discovered that when doing a Nordic ski race travelling over cold snow and through dry air was leaving me very dehydrated and very prone to cramping. Electrolytes solved this problem for me, but will not necessarily do so for others because there are probably five different causes of cramp. And electrolytes were followed closely by carbohydrate drinks and the advice on taking them at the correct concentration, i.e. the same concentration as the body. This was referred to as being ‘isotonic’ and it ensures that the carbohydrate drink (or any other drink for that matter) enters into our bloodstream very quickly. From this point on endurance athletes like long-distance road cyclists, were able to take in a much larger number of calories during the period they were actually racing. A Tour de France racing cyclist is burning between 6 and 7000 caloriess per day. The 4-4-9 rule for managing your calorie intake. The 4-4-9 rule about the number of calories per gram of food type is only approximate but it is a good guide. There are 4 kcals per gram in carbohydrate and protein but 9 cals per gm in fat. This means that for very cold trips, which are self-supporting and you have to carry food over long distances, taking fat is a big advantage. This has remained unchanged from the very early days of polar exploration, and is still correct today. It also fits with human metabolism in that when breathing at less than 30% of maximum you are effectively fat burning, that is in a fat burning metabolism. I recall preparing all the food one long weekend for my trip to Greenland in 1992. The diet was exactly the same for five weeks and there was 6 ounces of margarine and 4 ounces of butter per person per day. My stomach turned at the thought of it! How on earth were we going to get through that I wondered? Anyway we had a Dr on the trip who was doing research and measurement showed that we consumed an average of 4400 cal per day. Here is what I try to do which needs very careful preparation the evening before. Assuming that I’m happy to carry 1.5 – 2 L of water (But dont forget that water weighs 1kg per litre) in my bladder then to be isotonic this will take around six scoops of carbohydrate. This amounts to 380 calories for absorption during the day. So what we eat before starting is worth thinking about carefully. 4am starts can be maybe stressful. Have a bottle of Carbo; prepared the night before and after a ‘stock liner of ( say porridge) this will ensure your liver and muscles are well loaded before starting. And when you finish the day end it by taking a mix of Protein and Carbohydrate, (say another 200 cals within 40 mins when your body.liver and muscles are the the most absorptive. This is a considerable help to recovery for the following day. Don’t wait for the meal in the hut even if it’s only going to be an hour. So what about food for a backpacking trip. One is moving much more slowly here and therefore not draining your glycogen stores. But also the key factor is that I am simply not strong enough to carry food for more than four or five days. So an intake of about 2500 to 3000 cal per day seems to be about enough when coming into a them breakfast about every four or five days and having a big feed up. Here are some of the foods we would take on some of these trips. Selection is a matter of personal choice after bearing in mind the right sort of content. Glycaemic index – what it’s about. The glycaemic index was originally introduced to help sufferers of diabetes but it’s also a help for all of us when selecting foods. It only applies to carbohydrates and not too fat and protein. There is a scale of 1–100, the higher the number the faster your blood sugar is increased. Many years ago when I began my alpinism, I was still feeding on Mars bars. I asked a friend of mine John Brailsford (used to work at Loughborough and was the head of the outdoor education course at Bangor in the 1980s) – how come when I have a Mars bar after 10 hours on a mountain route with still some time to go it doesn’t seem to last very long. This is because you are getting a sugar spike he said it simply dumps you very quickly. You should be eating something that is less sweet. What he was saying in today’s terms is that I was taking a high GI index food. From that time on I have never taken Mars bars sweets or chocolates on a mountain day because specialised bars were becoming available which had a complex carbohydrates and even a small amount of protein. So what we need to start a bid day on the hill is low GI foods to sort of ‘line our stomach’. In an area where you have plenty of clean waters such as the Pennines and Scotland my strategy for a competition is to start with my personal bladder quite full but my Camelbak bladder completely empty. Then after two hours fill with water in the nearest stream, having pre placed the introduce carbohydrate powder in it. ……….and how to prevent them freezing when in the alps or ….If it’s possible then fill your bladder with slightly warm water and keeping well protected from the cold by putting it inside the pack against your back. However it is the tube which is the most vulnerable and it’s worth buying an insulated cover which also encloses the bite valve. See illustration. The small zip cover at the end also has room to introduce a carbon active device which would help prevent bite valve from freezing. There is also another safeguard and that is when you finish drinking to blow back down the tube so there is no liquid left in it. How to prevent bacteria and clean them if needed. If you use carbohydrate in your bladder (instead of for example electrolyte) then bacteria love feeding on carbohydrate and you will need to be much more careful on cleaning at the end of the day. You need to buy a cleaning brush for the tube and one for the bladder itself and also dry the bladder by leaving it open with the closure inside to keep it open and able to dry. 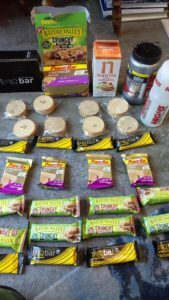 The options of bars, gels and carbohydrate powder; what to use when and why. Nutrition and hydration Strategy on an alpine climb. Gatorade founded 1963 perhaps the first of all sports drink and food companies. Q. How did you manage to 6 ounces of fat per day in Greenland? A.The margarine was simply mixed into the potato smash and spread very thickly on biscuits before we put the cheese on. Q. at the end of the day I like to have large lump of cheese. Any comments? Yes if you been having fairly sweet things a lot of the day your taste buds certainly are craving for something like cheese. However fat is slow to assimilate which you can do overnight, no problem. However if you have had a hard day and your glycogen stores in your liver and muscles are depleted and you going to have another hard day following then having a carbohydrate/protein mix drink within 30 minutes of finishing the day’s activities will ensure that your recovery for the day following is much better. Q. Were there any fun stories by Will Paish? A.Yes he told about many years ago (i.e. prior to the 90s)being called into a rugby club to investigate how to improve performance. He noticed that the club and the players had an enormous luncheon on Saturdays immediately before the game. On enquiring with some players how they managed to play on such a heavy meal he was told, we just go into the loos and sick it up! So Wilf went to the Rugby board and proposed to eliminate the big lunches on match day. The board was very pleased because they said ‘oh that’s great we are going to save a lot of money on the lunches’. Simply gives an idea of the primitive zone we were in several years ago and the distance we have come in sports nutrition.